We’ve launched a new website for Bedford County, Virginia’s Office of Economic Development. Bedford County is a rural county of over 75,000 residents and situated between the cities of Lynchburg and Roanoke. The new website was developed as an initiative of the Economic Development Authority to promote the county’s business assets and attract new and expanding companies. Bedford County has a strong agriculture industry, but in recent years it has attracted high tech firms in nuclear energy, wireless communication and advanced manufacturing. The Center for Advanced Engineering & Research (CAER) is located in Bedford County’s 500-acre New London Business & Technology Center and has a simulator of the next generation of a nuclear power plant control room among its many features. 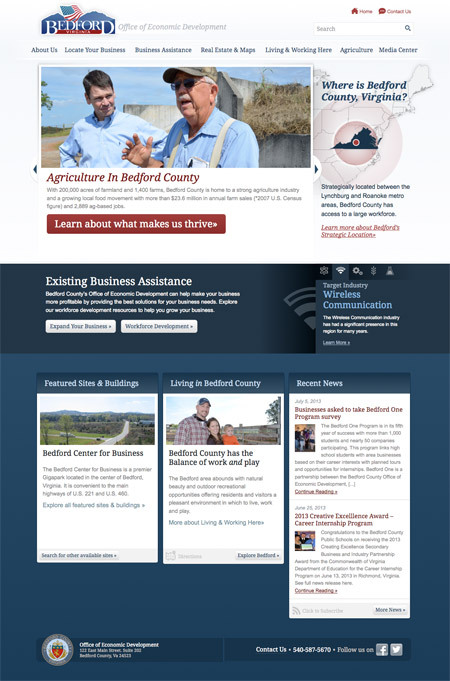 In addition to key economic development data, maps and a real estate search tool, the website also contains information on the Bedford One program which connects high school students with industry based on their career interests, as well as Bedford County’s Agricultural Economic Development Advisory Board, and the Bedford Grown program. "Rick Whittington Consulting began the project by initiating a kick off meeting and asking the right questions to ensure success. We were pleased that they remained committed to stay within budget and help us meet the deadlines we set at that first meeting. We are pleased with the response we have received so far from our existing business community, county officials, and local media," said Traci Blido, Bedford County's Economic Development Director.